The Kardashapps are here! The Kardashapps are here! Unless you use KardBlock (wait, if you do have that enabled, then how'd you get here? ), then there's no way you haven't heard that Kim Kardashian, Khloe Kardashian, Kendall Jenner, and Kylie Jenner launched a pile of new websites and apps. (Ahhh but what about Kris Jenner's eldest child? Don't panic! Kourtney Kardashian's site and app will be out later this year.) 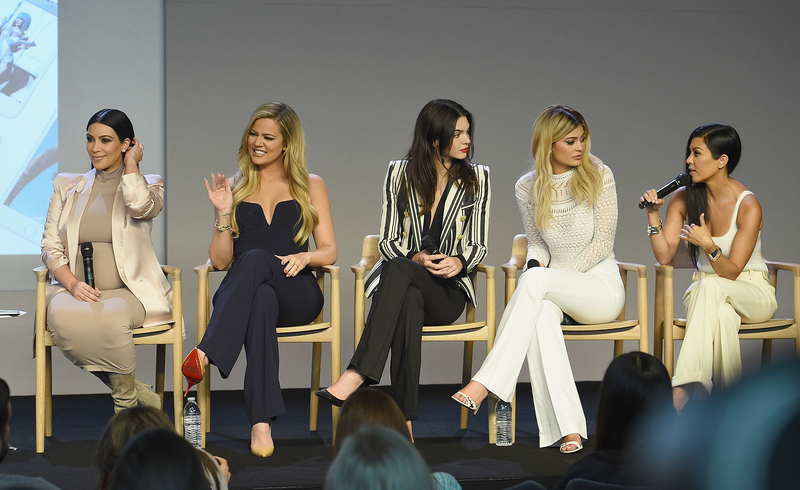 On Monday, all five sisters dropped by the SoHo Apple Store to promote the Kardashian/Jenner apps, which they explained represent each of their different personalities. We all have such different personalities. We obviously love a lot of the same things, but then we have such different passions. Kylie loves her makeup and she's really into showing a lot of her dogs and the things that are in her house. Kendall is always running around all over the world modeling, having these amazing adventures. Kourtney has this whole mom life that’s so inspiring. And Khloe with her fitness. And mine is kind of fashion. And we all have tutorials so we all have such different personalities but we're so excited to share that and give this extra in-depth glimpse. Though the siblings did not collaborate on the apps and sites, Khloe remarked that there is an undeniable cohesion. "The Whalerock team wouldn't tell us what the other sister was doing. And so when we saw them all collectively and they all sort of emulated each other," Khloe explained. "It's just sort of the blood of the sisters, I guess." If a Kris app does happen one day, I hope it includes a "Kris Teaches You How To Use A Neti Pot" game.